After performing at the first Vintage Band Festival (VBF) in 2006, it was a great thrill to return this summer to perform with the Newberry Band again at the second festival. VBF director Paul Niemisto deserves a hearty “huzzah!” (and so much more) for organizing and hosting such a terrific festival. Paul’s incredible army of volunteer staff could not have been more helpful, friendly, and efficient. They are truly the unsung heroes of the festival. It was a distinct pleasure to perform in all of the beautiful venues in Northfield and to enjoy such generous hospitality. I especially enjoyed speaking with so many audience members after our concerts. Several people told me how they remembered the old bands and appreciated how the Newberry Band represented that tradition. I’ll never forget the older gentleman who related to me – with tears in his eyes – his long career as a band director after our concert in Bridge Square. 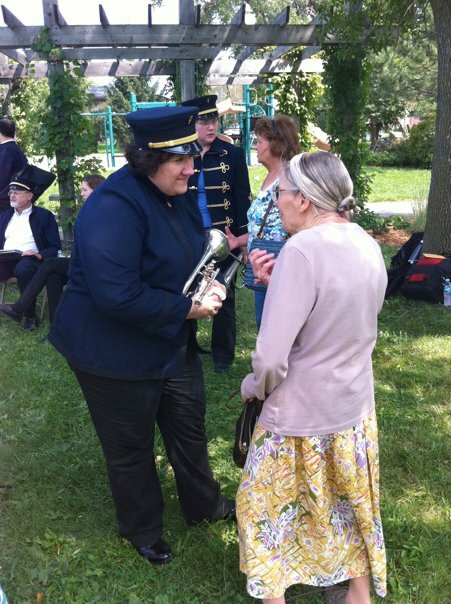 Having already discussed my own family connection to the Sousa band in a previous post, I was touched to meet another woman with band heritage in her family, Joy Riggs, after our concert in Northfield’s Way Park. Joy maintains a terrific blog, My Musical Family, and she even mentioned the Newberry Band in a recent post (click on the link and scroll down). It was a privilege to “meet” her great-grandfather, G. Oliver Riggs, who was also a bandleader and cornet soloist in the 1880s. The Newberry Band had a very busy performing schedule at the festival (seven concerts in three days plus a church service) and it was great fun to play in so many beautiful venues. 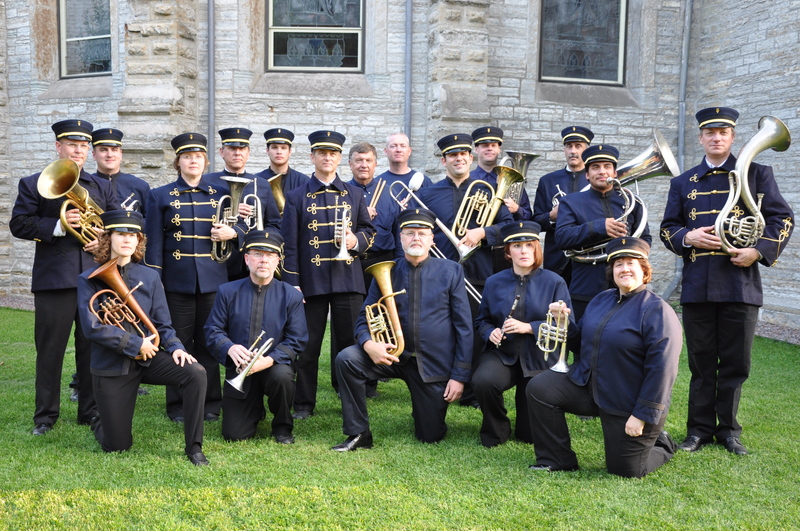 Although I regretted not having the opportunity to hear many of the other fine bands at the festival, it was nice to reconnect with many of my friends in the Historic Brass Society who were holding their annual meeting in conjunction with the festival. It was a real kick to participate in the “Battle of the Bands” with our friends in the 1st Brigade Band of Wisconsin; they are a fine Civil War band with authentic uniforms and a marvelous collection of historic instruments. It’s hard to describe how much I love playing my antique Seefeldt cornet, a beautiful and rare instrument that I can only play with the Newberry Band because it is pitched at A=452 Hz (Old Philharmonic Pitch). The cornet’s dark chocolate tone and easy response are just as gorgeous as its elaborate engraving and gold wash bell. Playing that instrument is a mystical experience that transports me back to a simpler time that is somehow more in tune with my artistic personality. But there’s one more reason why the Vintage Band Festival is so special to me: I wrote my dissertation on a vintage bandleader, Salvatore Minichini. Having spent so many years researching that band, it means even more when I play with the Newberry Band. We even wear that same hats! 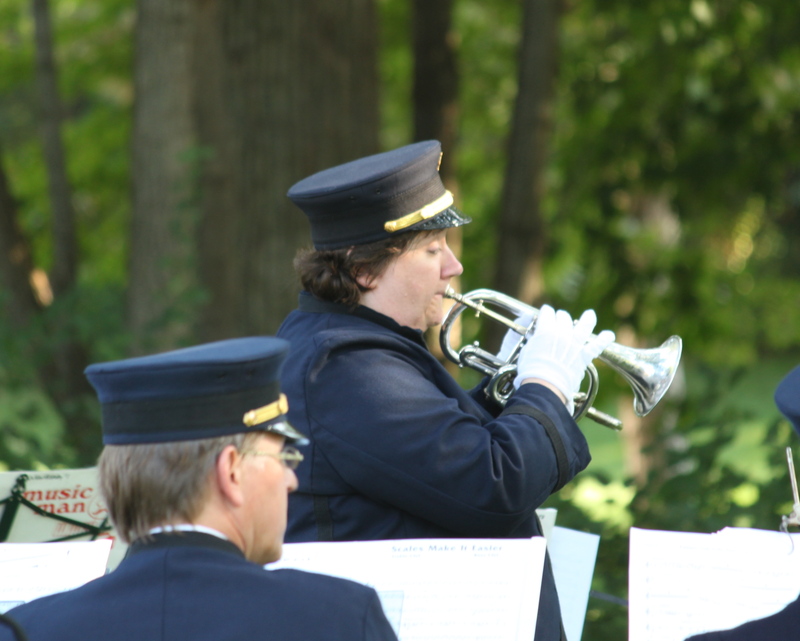 I will always be grateful to Michael O’Connor for inviting me to join Newberry’s Victorian Cornet Band back in 2005. Little did he know how much it would mean to me to have the opportunity to connect with my musical heritage in so many significant ways. And above all, it’s great fun to truly be “the leader of the band”! So as I return to my not-so-normal life as an orchestra conductor and college professor, here’s one more picture of my friends in the Newberry Band. Looking forward to playing with you guys again in the future! Thanks Elisa! We just have to find a way to get everyone in those new uniforms. They look great. my name is marcantonio pezzano. I am an afectionato of the Italian band tradition. 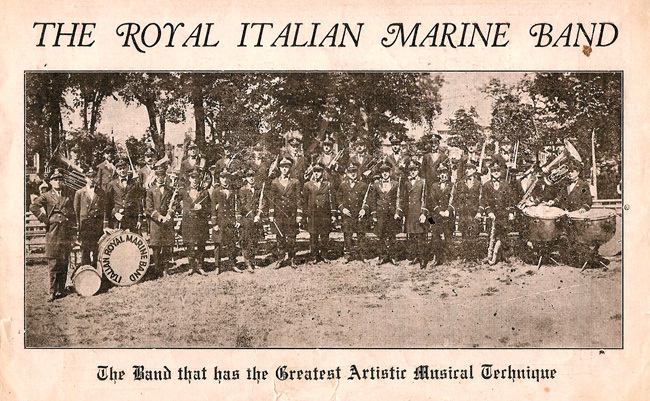 and right now I am doing whatever I can to do whatever I can to record all the information I can gather on this tradition in the us, I’ve recently counted some twenty Italian style bands left in the usa. I read about the wonderful work regarding the great maestro prof. Salvatore minichini. my grandfather and all the Italian immigrants I remember speaking in awe of prof minichini’s talents. I do have two 78’s of his collection of symphonic marches. I would really love to speak with you and poosibly visit to see the items in the maestro’s collection. I live in ny on long island. was wondering if I can make an appointment to view the collection.